I've been slacking in the blog posting lately... I hope to find a new schedule where i can fit it all in soon. 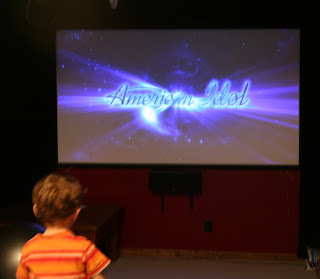 *American Idol -- he loves watching Americal Idol -- and when we occasionally watch other concerts (Austin City Limits) he'll tell us that we need to find another Americal Idol show if he doesn't like it. *THE Bear puppet -- The one that he hated for so long - he has now fallen deeply in love with, sometimes to the point i think he might start liking it more than 8 of 10 'lambies'. That's pretty serious. *Belts -- He's noticed that we wear belts - and he wants one too -- but he calls his a "seat belt"
Ben is a typical Leo with the hair. (A lion proud of his mane.) I don't know of a Leo who isn't obsessed with his or her hair. (Think Mimo) My grandmothers (2) and my aunt were Leos. They were always telling me to go comb my hair. Maybe they'll fix the baldness thing by the time he's a teenager. If not, another reason for therapy. Man, what's with all the spam on poor Ben's comments??? seat belt!!! too funny!! does he vote after watching idol ?